An epic that broke up two marriages, nearly killed a film studio, and reigned as the most expensive film ever made for 30-plus years. A thriller that made flocks of birds a fearsome sight for an entire generation. 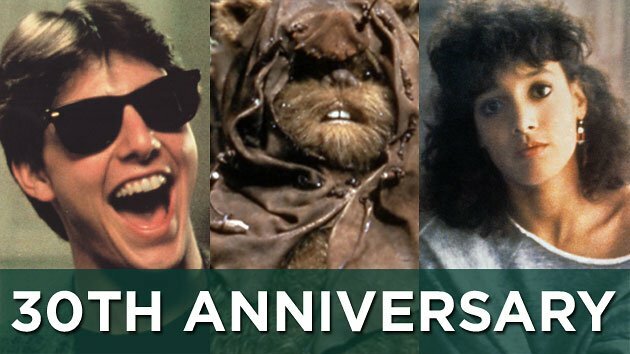 Throw in the last great “Star Wars” film (before prequels and Jar Jar Binks dimmed the franchise), a few holiday classics (including an unlikely “holiday”), World War II tales of heroism, and pop-culture peaks and a Valley Girl, and you have a 2013 packed with notable movie anniversaries. 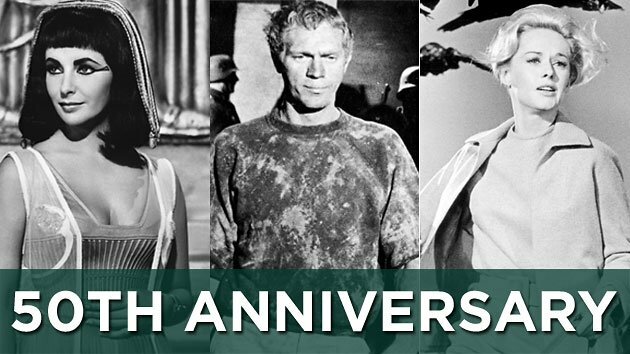 Other cinematic greats — and not-so-great but definitely memorable — will be observing their 20-, 25-, 30- and 50-year milestones in 2013. Start chilling the bubbly and consider what’s coming up the anniversary queue. “The Birds” (March 28, 1963). Cinephiles have had a run of Alfred Hitchcock homages lately, from Anthony Hopkins’s take to the HBO focus on the British director’s tortured obsession with his leading lady, Tippi Hedren. She starred in the eco-horror movie, inspired by the 1952 story by Daphne Du Maurier (who also penned the notable “Rebecca”) and a real-life incident of suicidal birds at Monterey Bay, California. (Decades later, toxic algae was fingered as the culprit.) Horror films have become far more gruesome these benumbed days, but this chiller still holds up. “Cleopatra” (June 12, 1963) The epic, starring Elizabeth Taylor, Richard Burton and Rex Harrison, ran 3 hours and 12 minutes (cut from 6 hours) and cost $44 million — a big difference considering the original budget was $2 mil. Adjusted for inflation, that number positioned “Cleopatra” as the most expensive film made until 1995. (It now has fallen to No. 16.) 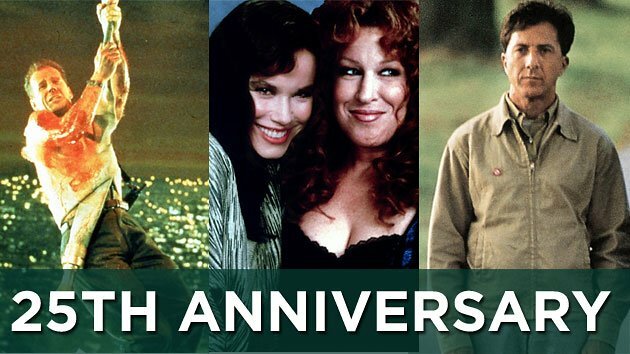 The behind-the-scenes lore — Taylor almost dying of pneumonia, to the married stars falling in love with one another, Fox’s near-bankruptcy — may be arguably more enduring than the movie itself. 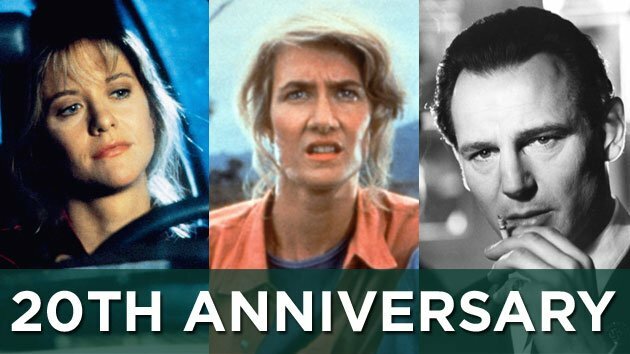 Fox Entertainment in the UK issued an elaborate, all-region Blu-ray anniversary spectacular (the 4-hour cut, among other goodies) back in January 2012, but a U.S. version might be due out. “The Great Escape” (Aug. 8, 1963). A Nazi prison camp stocked with escape artists sounds like the stuff of Hollywood fiction, but this enduring classic was loosely based on a true story about mostly British and Canadian soldiers. (Archaeologists unearthed the real tunnel in 2011 for a British documentary.) Hollywood though co-opted the tale and stocked it with (largely American) stellar talent like Steve McQueen, James Garner, Richard Attenborough, and James Coburn. The film received only a single Oscar nomination (for film editing), but the lack of contemporary acknowledgement didn’t stymie its path to cinematic classic. “It’s a Mad, Mad, Mad, Mad World” (Nov. 7, 1963). Every so often, marquee names pack themselves into a comedy like frat boys in a telephone booth (or whatever the equivalent is these days). This Cinerama scavenger hunt bundled together the disparate talents of Sid Caesar, Ethel Merman, Mickey Rooney, Spencer Tracy, Jerry Lewis, the Three Stooges and more (though, alas, no Groucho Marx or Stan Laurel). Notable for being a historical comic time vault. “Risky Business” (Aug. 5, 1983). Before couch leaps, Scientology, and messy divorces, Tom Cruise was a fresh-faced young lad who danced in his underpants to stardom. The satire about a privileged suburban high school senior turned pimp received raves in its day, restored Wayfarers as a fashion icon, and made many a “best high school movies” list. Cruise would go on to pursue more dramatic leading-man roles with an action bent, although he’s had a mixed return to comedy, most successfully in “Tropic Thunder.” Time for a “Risky” sequel? “Star Wars Episode VI: Return of the Jedi” (May 25, 1983). Directed by Welsh filmmaker Richard Marquand (who would die of a heart attack just four years later) and with George Lucas hovering nearby, this was the last of the (original) trilogy that would change how Hollywood made — and merchandised — its films. While the unlikely battle of cutesy Ewoks was among the things criticized in this third installment, the later prequels would feature far more annoying creatures. “Flashdance” (April 15, 1983). A woman who welds by day and gyrates by night — and all she wants to do is go to ballet school. The glorified music video received both an Oscar nomination (for the song “What a Feeling”) and a Razzie for worst screenplay by Tom Hedley and “Showgirls” scribbler Joe Eszterhas. The Gen-X “standard” was based on the true story of a Canadian construction worker and stripper, Maureen Marder, who received just $2,300 out of the whole enterprise. “A Christmas Story” (Nov. 18, 1983). Holiday movies worth watching again have been surprisingly sparse in the past few decades (unless one counts “Bad Santa,” which we sure do). Few contemporary ones rival writer Jean Shepherd’s reminiscences of an Indiana childhood. To this day a Red Ryder, succumbing to the temptation of licking a frozen flagpole, and the leg lamp remain must-have Christmas items. A bonus: that nice Peter Billingsley has grown up to be a nice young producer engaging in curious enterprises with the unlikely likes of Vince Vaughn and Glenn Beck. “Die Hard” (July 15, 1988). As his groundbreaking television dramedy “Moonlighting” (co-starring Cybill Shepherd) was in its death throes, Bruce Willis was making a floundering transition to the big screen, with dead-on-arrival comedies like “Blind Date.” Then he made a 360-degree turn into pure unadulterated action and ironically got typecast as an action hero for years. In this first of a series, Willis waged a one-embittered-cop war against bank robbers disguised as terrorists, memorably led by Alan Rickman. The thriller, based on Roderick Thorp’s novel “Nothing Lasts Forever,” was almost a vehicle for Frank Sinatra and later Arnold Schwarzenegger. Just in time for its silver anniversary, sequel No. 4, “A Good Day to Die Hard,” brings in McClane Jr. (or actually Jack, played by Australian actor Jai Courtney) with Dad for Valentine’s Day. Yippee-ki-yay. “Rain Man” (Dec. 16, 1988). The year 1988 was a danged good one for notable dramas. This Oscar winner, starring Tom Cruise as a car dealer and Dustin Hoffman as his hitherto-unknown savant brother, was a generational hand-off of sorts from one leading man to another. The film combined a number of movie themes — inheritance, coming-of-age and road trip tropes — but also publicized autism at a time when the neurodevelopmental disorder was becoming more widely diagnosed. “Scrooged” (Nov. 23, 1988). Contemporary holiday classics are hard to come by, and frankly, another remake of Charles Dickens’ “A Christmas Carol” is kind of a cheat, since they’re guaranteed at least to be revived in an annual debate on who’s the best Scrooge. Bill Murray as a TV executive in need of ghostly interventions got mixed reviews from critics, but the film has proved to survive the passing of Yuletides. “Jurassic Park” (June 11, 1993). Here’s one thriller that has already made plans to party: A 3D re-release will be out April 5. This heady mix of Steven Spielberg’s directorial talents, writer Michael Crichton’s plot, and computer-generated dinosaurs cemented our pop culture obsession with special effects and prehistoric giants. The sci-fi thriller might also be credited with the subtrend of nerdism, as kids could bandy about words like “Velociraptor” without getting a playground wedgie. Mother Nature though wasn’t going to take a backseat entirely to CGI: Hurricane Iniki raged over Kauai during filming, and some storm scenes were put to use in the movie. “Schindler’s List” (Dec. 15, 1993). This was basically Steven Spielberg’s year: After breaking box-office records with “Jurassic Park,” he delved into history to honor the story of Oskar Schindler — a project Spielberg actually tried to get other, more experienced directors to do before he finally took it on himself. Stars like Warren Beatty read for the part, but Liam Neeson ultimately starred as the German businessman who sheltered Polish Jews in his factory, spending much of his fortune to save as many lives as possible. The drama has remained on the American Film Institute’s Top 10 list, and was a turning point for Spielberg, stars Neeson and Ralph Fiennes, and the way Hollywood told the story of the Holocaust. “Groundhog Day” (Feb. 12, 1993). Watching a groundhog’s shadow is more a media-manufactured event than a true holiday. Still, Bill Murray enshrined the day with this surreal, almost Buddhist tale of a rude weatherman forced to relive the same day again and again until he developed empathy. Sure, maybe it’s just “Scrooged” without ghosts, but the Capra-esque vibe has made this one of Hollywood’s go-to fables. “The Wedding Banquet” (Aug. 1, 1993). A Taiwanese American co-production directed by, naturally, Taiwanese American Ang Lee, the comedy about a man who agrees to marry to hide his gay relationship from his parents was a small one, from its $1 million budget to its respectable $7 million grosses. Yet besides being nominated for a Best Foreign Language Oscar, the comedy showcases Lee’s incredible genre-leaping bounds; his works would later include “Sense and Sensibility,” “The Ice Storm,” “Crouching Tiger, Hidden Dragon,” “Brokeback Mountain,” “Hulk” (the snoozer of the bunch) and “Life of Pi.” More than anything, “Banquet” is part of an admirable pantheon and holds up mighty well, two decades later when gay marriage has emerged as a hot-button political issue.